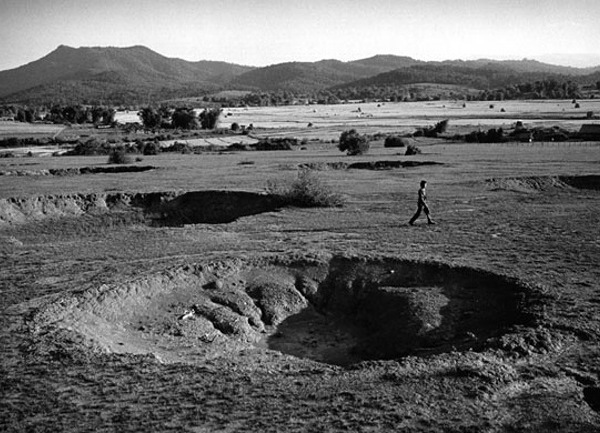 From 1964 to 1973, the US dropped two million tons of bombs on Laos. The horrendous effects are still being felt. In April 2012, Nengyong Yang, a farmer in Laos, was cutting a tree in his field, preparing to plant corn. As Nengyong was hacking away, a bomb lodged in the trunk of the tree exploded in his face. Nengyong survived, but lost both his eyesight and his ability to provide for his wife and four children. Two months later, his wife found his lifeless body hanging from a tree. Nengyong is just one of roughly twenty thousand people who have been injured or killed by unexploded ordnance (UXO) in Laos since 1973. The UXO is the legacy of intensive American bombing of Laos from 1964 to 1973, when the United States dropped two million tons of bombs on the country — more than twelve times the amount of bombs dropped on Japan during World War II. Laos is, per capita, the most heavily bombed country on Earth. In the United States, the intervention in Laos is known as “the Secret War” because the government concealed everything about its activities. But to Laotians, the effects of the American bombardment have never been a secret. A coalition government of rightist, neutralist, and leftist factions was meant to administer power, but this proved impossible in the geopolitical climate of the time. The United States endeavored to keep both neutralists and the left-wing Pathet Lao (the nationalist, communist organization that had fought against the French) out of power through bribery and rigged elections. Disenchanted by a political process that denied it participation, the Pathet Lao returned to fighting, and Laos was soon engulfed in a civil war that pitted the Pathet Lao (backed by North Vietnam) against the right-wing royalist government (backed by the United States). At the same time, North Vietnamese forces began infiltrating Laos on the Ho Chi Minh Trail, intensifying US involvement in Laos. On the ground in Laos, the CIA organized and trained a mercenary army of ethnic Hmong to fight the Pathet Lao. Led by Vang Pao, a brutal commander who summarily executed those who crossed him, the mercenary army suffered tens of thousands of deaths. Vang Pao began recruiting child soldiers to keep up with the heavy losses and trafficked opium to help finance his operations. These activities were given the green light by the CIA (in fact, the opium was transported on Air America flights, an airline covertly operated by the CIA). The worst destruction, however, came from the sky: from 1964 to 1973, the United States flew 580,000 bombing missions over Laos. The ostensible targets were Vietnamese communist troops and Pathet Lao forces. In practice, however, the targets were anything that moved, as eyewitness and refugee testimonies indicate. Some of the bombings were carried out merely to make life more convenient for the American bombers: if they couldn’t find their targets over Vietnam, the pilots would deposit the bombs over a random location in the Laotian countryside, because the planes couldn’t land with ordnance still on board. The human cost of the US bombing campaign was immense. Fred Branfman, an international aid worker living in Laos, encountered refugees fleeing from the Plain of Jars region, an archeological landscape of ancient stone jars and also the site of intensive American bombing. Speaking Laotian, Branfman talked to the refugees and collected essays and drawings about what it was like to live under the bombardment. He published his findings in an important book, Voices from the Plain of Jars: Life under an Air War . The refugees spoke of a relentless campaign of destruction: entire villages incinerated, temples and schools destroyed, livestock killed, people buried alive in holes they dug trying to escape the bombs, people burned alive by napalm and white phosphorous, others forced to live underground in caves for years. I saw my cousin die in the field of death. My heart was most disturbed and my voice called out loudly as I ran to the houses. Thus, I saw life and death for the people on account of the war of many airplanes in the region of Xieng Khouang. Until there were no houses at all. And the cows and buffalo were dead. Until everything was leveled and you could see only the red, red ground. I think of this time and still I am afraid. The planes bombed every day. After they bombed my village, they bombed the roads and the small paths, and also completely destroyed our ricefields. After that we had to dig other holes even further away because we were so afraid. On the days that the airplanes would come we were so afraid we didn’t want to eat. I pitied my children, for when the airplanes came to bomb my ricefields, they were afraid and afterwards would weep loudly. I was very afraid and could not even close my eyes to sleep. In 1968, there were no houses remaining in my village at all; and all my cows and buffalo had been killed. The United States ended the bombing campaign in 1973 after signing the Paris Peace Accords. Two years later, the Pathet Lao achieved victory over their royalist enemies and took control of the country. For Laotians, however, the effects of the devastating air campaign would linger for decades. A third of the bombs failed to explode on impact, thus becoming UXO. Some of the most harmful munitions were cluster bombs, which were dropped inside casings meant to open in mid-air and spread the “bomblets” over a wide area. About 80 million cluster bombs didn’t detonate; less than one percent of all UXO has been cleared. Typical victims of UXO include farmers, scrap metal collectors, and children. Farmers often know explosives may be lurking beneath their fields, but must plough them anyway or lose their livelihood. Scrap metal collectors find old bombs for the purpose of selling the metal in them for a few pennies, often mistakenly believing they are dead. Many victims of cluster bombs are children, because the small, round shape of the explosives look like toys. Beyond killing and injuring people, UXO also prevents development and perpetuates poverty. Construction projects are delayed or abandoned due to the cost of UXO removal. Children drop out of school to care for disabled parents. The health care system is unnecessarily burdened. There are numerous NGOs in Laos clearing the UXO and helping the victims — but it’s not nearly enough. There are simply too many bombs. According to UXO expert Mike Boddington, cleaning up all the UXO in Laos would cost roughly $16 billion. Is the United States doing anything to help clean up the bombs it dropped and assist the victims of its atrocities? Hardly. To date, the US has allocated $85 million to help get rid of the UXO — nowhere near the amount required and a pathetic figure compared to the $18 million (inflation-adjusted) the United States spent per day bombing Laos. There’s no reason the US can’t afford to remove the UXO — the $16 billion needed is less than three percent of the amount the US spent on the military in 2014. It is clear the United States doesn’t have any interest in ending its aggression, but has it at least refrained from dropping the same deadly cluster bombs on other countries that have inflicted so much misery on Laos? No. Unlike 116 other countries, the United States refuses to sign the Convention on Cluster Munitions — which would ban the “use, production, transfer, and stockpiling of cluster munitions.” It has even pressured its allies to reject the prohibition and to sit out the treaty negotiations. Since 9/11, the United States has used cluster bombs in Afghanistan, Iraq, and Yemen. The US has also exported cluster bombs to numerous countries, including Israel (which used them in its assault on Lebanon in 2006) and Saudi Arabia (which used them to attack Yemen in 2015). The extreme brutality of the bombing of Laos, the unwillingness of the United States to help the victims, and its continued use and export of cluster bombs demand accountability. For the sake of Nengyong and so many others, such barbarous and shameful acts should no longer be ignored. Brett S. Morris is a freelance journalist and the author of 21 Lies They Tell You About American Foreign Policy.